(1) Categorically exempt from the California Environmental Quality Act per Section 15304, Minor Alterations to Land, and (2) That the Master Plan is consistent with the City of Placerville General Plan. Environmental Review: Categorically exempt from environmental review pursuant to Section 15061(b)(3) of the California Environmental Quality Act (CEQA) Guidelines. Amendments are necessary to conform to the changes in Government Code Section 65852.2, made by Assembly Bill 2299 (Bloom) and Senate Bill 1069 (Wieckowski), pertaining to the development of accessory dwelling units and associated provisions related to parking, design and development standards. Amendments are as follows: deletion of the definition of “dwelling unit, secondary”, and the addition of the definitions of “director”, “dwelling unit, accessory”, “dwelling unit, attached accessory”, “dwelling unit, detached accessory”, “kitchen”, “living area” and “passageway” in Section 4 of Chapter 1 of Title 10; replacing in its entirety Section 12: Secondary Dwelling Units of Chapter 4 of Title 10 with “Section 12: Accessory Dwelling Units”, and amending all references of “secondary dwelling unit” within Chapter 5 of Title 10 and replacing with “accessory dwelling unit” of the Placerville City Code. Environmental Review: Statutorily exempt from environmental review pursuant to Section 15282(n) of the California Environmental Quality Act (CEQA) Guidelines. 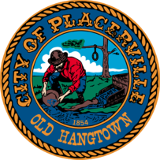 Amendments to the Zoning Map and Zoning Ordinance that would establish a Downtown Placerville Historic District; and amend the boundary of the adopted City of Placerville Historic District established by Ordinance 1280, adopted on August 25, 1981. City Council directed staff to issue TUP 17-01 and an Encroachment Permit for the installation of a parklet to be located on Main Street occupying a single parking space within the public right-of-way. Placement would begin in May 2017 and end September 30, 2017. Amended the Placerville City Code adding Section 10-5-14: HO, Housing Opportunity Overlay Zone, to the Zoning Ordinance. Ordinance would assist in the implementation of Program 3 of the 2013-2021 Housing Element, to accommodate the City’s unmet housing need for lower income households. The HO Overlay would allow a density of 20-24 units/acre. Projects within the HO Overlay would be required to develop a minimum mix of affordable dwelling units: thirty percent (30%) of the total units in the development for very-low income households and twenty percent (20%) of the total units in the development for low-income households. Required affordable units will remain affordable to these income levels for a minimum of thirty (30) years. The Overlay Zone would allow development on a parcel that has the HO Overlay Zone either in the manner provided under the Ordinance or the manner provided in the base (underlying) zone, but not both. The Overlay Zone would offer property owners an alternative development option, allowing increased flexibility for the future development of their properties. Adding Section 10-4-19: Outdoor Dinning Regulations to Chapter 4 General Regulations. This Ordinance would allow and regulate outdoor sidewalk dining areas within the public right-of-way adjacent to restaurants and cafes. The City of Placerville Development Guide is an implementation document of the City of Placerville’s General Plan. The preparation and execution of this Development Guide are intended to fully incorporate the goals and objectives of the General Plan as they relate to community design into the development process. Amendments to the Zoning Ordinance regarding the keeping of six hen chickens within single-family residential districts. Tentative Parcel Map involving three (3) parcels with net square feet as follows: Parcel A: 13,314.6 sq. ft.; Parcel B: 8,640.7 sq. ft.; Parcel C: 14,134 sq. ft. Note: One year City map extension, Ordinance 1628, effective April 8, 2009; Two year state map extension, effective July 15, 2009; Two year City map extension, Ordinance 1637, effective April 8, 2010; Two year state map extension, AB 116, effective July 11, 2013.